The bodies of the seven victims of Monday’s gun attack on a motorcade of election officials and law enforcers in Baghaichhari upazila of Rangamati were handed over to their families on Tuesday. 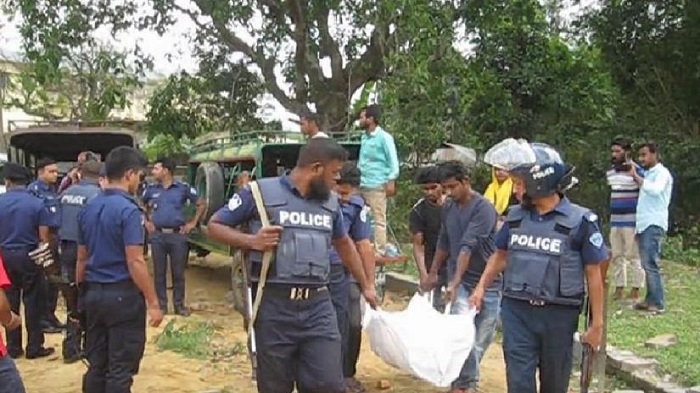 Family members received the bodies in the afternoon after their postmortems at Khagrachhari Modern Hospital, said officer-in-charge (investigation) of Baghaichhari Police Station Jahangir Alam. The victims are M Amir Hossain, assistant presiding officer of a polling centre at Kanglak under Sajek and a teacher of Kachalong Girls’ School, Abu Tayeb, 40, a teacher and a polling officer, Ansar VDP members Jahanara Begum, 40, wife of Tafsil Ahmed of Kachalong Bazar, Mihir Kanti Dutta, 40, son of Sadhu Basak of Karoshtali, Bilkis Akther, 50, daughter of Nur Ali of Paillagona, M Al Amin, 25, son of Selim of Sarikkha, and vehicle helper Mantu Chakma, 25, reports UNB. Meanwhile, a seven-member probe body has been formed with Local Government Division Director Dipak Chakraborty as its head to look into the gun attack, said Deputy Commissioner of Rangamati AKM Mamunur Rashid. He said Chattogram Divisional Commissioner Abdul Mannan constituted the investigation committee on Tuesday night. The other members of the probe panel are Additional District Magistrate Nazrul Islam and representatives of Chattogram Range deputy inspector general of police, Border Guard Bangladesh, district police, Chattogram Hill Tracts Development Board and Rangamati District Council. The probe body was asked to submit its report within 10 days, the DC added. On Monday, seven people were killed and a presiding officer among 24 was injured in the gun attack on the motorcade of the election officials and law enforcers when they were returning from three centres in Sajek after voting in the 2nd phase upazila election. Terrorists opened fire on the last vehicle of the convoy from a hill, leaving six people dead on the spot. Seven of the injured were brought to the Combined Military Hospital in Dhaka from Chattogram CMH on Tuesday where a total of 17 were admitted on Monday. Besides, seven more injured were receiving treatment at Baghaichhari upazila health Complex. Meanwhile, joint forces have launched a drive in the hilly region following the gun attack. Bangladesh Army’s Khagrachhari regional commander Brig Gen M Hamidul Islam who visited the spot on Tuesday said law enforcers launched the joint drive soon after the attack. However, they were yet to make any arrest. He said no one will be spared over the gun attack. Parbatya Bangali Chhatra Parishad called a daylong hartal in Khagrachhari district for Wednesday protesting the killings of the seven people and Bilaichhari upazila Awami League president Suresh Kanti Tongchanga. It was announced in a press release signed by parishad’s acting general secretary M Rabiul Islam. The dawn-to-dusk shutdown is also meant for demanding the removal of female MP Basanti Chakma. Suresh Kanti was gunned down by some miscreants at Farua in the upazila of Rangamati on Tuesday morning.